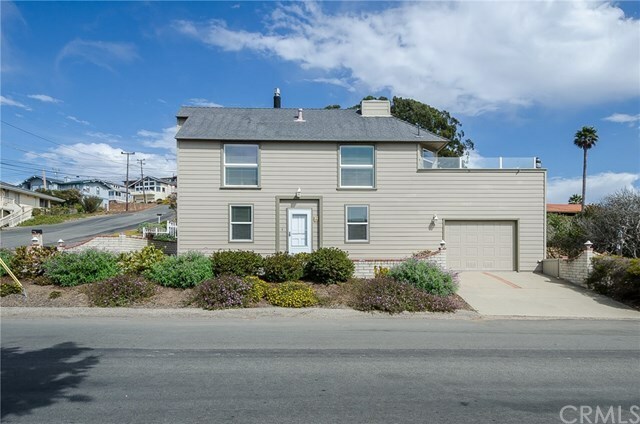 This immaculate North Morro Bay home is located in a peaceful setting on a corner lot that includes upper level views of Morro Rock as well as the Pacific Ocean. Well maintained and move in ready, the two-story home with approx. 1372sf of living space has a 3 bedroom, 1.5 bath floorplan that offers numerous amenities and upgrades. The upper level living/dining areas are open, full of light and include interesting architectural details in addition to view balcony access. The sparkling bright kitchen features a butlerâs pantry off the dining area and plenty of cupboard space. For ambiance, as well as warmth, the living room has a freestanding gas stove, cathedral ceiling, clerestory windows and built-in shelving. All bedrooms are downstairs and some feature closet organizers and mirrored closet doors. Property is fenced and has numerous draught tolerant plants for easy care. Upgraded sprinklers are in front and back. There is a one -car garage plus additional off-street parking that is super convenient.